A congregation of scattered baptized believers seeking to gather and worship in name of our Lord and Savior Jesus Christ met at Brady’s Gym in College Park, Georgia to formulate a course of action. Deacon Willie Smith was elected to serve as leader and spokesman for this group along with five other Deacons: Harry Gibbs, Charles Glenn, Walter Rainey, and Richard Sumrall which served as spiritual advisors. Several weeks passed and during one particular meeting, Mother Jessie Dixon stated “we should try to stick together and start our own church”… with this said, the group voted to accept this recommendation. 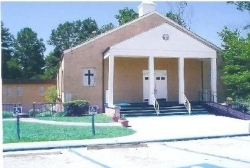 Deacon Harry Gibbs acted on this recommendation and contacted a lifelong friend Reverend Henry White, Pastor of Christian Missionary Baptist Church located on Old National Highway in College Park, Georgia. Reverend White agreed to allow this group of believers to hold Sunday morning worship services at 8am along with Bible Study and choir rehearsals on Tuesday nights. On the first Sunday, February 5, 1994 the first service was held for this congregation and the beloved Reverend Dr. Charles J. Sargent delivered the sermon “Why Are You Here?” With the continuance of this leadership, the first Holy Communion was first given in April 1995. Christians For Change Baptist Church was organized through the confirmation by conference on June 23, 1995 with one hundred and thirteen members as the organizing congregation. Reverend Dr. Charles Sargent was called in January 1996 to serve as interim Pastor. On February 29, 1996 joint boards met to discuss finding a permanent edifice to worship. On January 10, 1997 Trustee, Chairman Isaac Greer announced at conference that at a contract was placed on the property of 2110 Bethsaida Road in Riverdale, Georgia. During the months of February 1997 through October 1997 Reverend Burrell Brooks served as the first Pastor of Christians For Change Baptist. On Saturday, May 30, 1998 the Rev. Dr. Michael Wayne Baldwin was elected during a special election and has faithfully and spiritually fed this flock of believers. Under the leadership of Pastor Baldwin, many souls have been led to Christ, additional worship service added at 11am every Sunday morning along with the expansion of choirs, and many additional active ministries. God IS with us and to Him we magnify and give the glory for sustaining and allowing us to serve Him and be blessed in His name.